Co. Tipperary: Clonmel (8), Innislonaghty (2), Kilshelan, Lisronagh, Newchapel, Temple Etny. Co. Waterford: Killaloan, Kilronan (3), Rathgormack, Saint Mary's (2). The population falling within the union at the 1831 census had been 37,094 with divisions ranging in size from Killaloan (population 841) to Clonmel itself (16,140). The required modifications to the existing building cost £1,505 plus £794 for fixtures and fittings etc. The upgraded building could accommodate 600. It was declared fit for the admission of paupers on 1st January 1841 and admitted its first inmates the same day. The Clonmel Board of Guardians held their first meeting at Clonmel Courthouse at midday on 1st May 1839. William Perry of Woodroffe, Clonmel, was elected Chairman. John Lacy, a woollen merchant of Main Street, Clonmel, became Vice-Chairman. Lonergan (2000) gives a fascinating account of life in the Clonmel workhouse. In the first ten years of its operation, the workhouse seems to have been plagued by staffing problems. The first Master of the workhouse was Edward O'Riordan who had previously been Master of the old House of Industry. His daughter Mary became Matron. O'Riordan was forced to resign in 1842 when the unmarried inmate mother of a newborn male child revealed that O'Riordan was the father. The mother and child were also ejected from the workhouse. In 1845, the O'Riordan's successors, a Mr and Mrs Lumley, were dismissed after two inmates were found drunk. The next incumbents were Patrick and Catherine Ryan had a relatively brief tenure — Catherine died of fever in February 1847 and her husband was dismissed a month later, being considered unable to perform his duties adequately. Two further appointees both resigned after brief tenures. At the end of 1850, land for a new workhouse building was leased at a site to the north of the National Model School. The Poor Law Commissioners' architect George Wilkinson was asked to design a building for 1,200 inmates. His design was approved at a Board Meeting on 30th December 1850. Following the refusal of the Union's bank to agree a loan, the new workhouse was financed by the issue of bonds which raised the sum of £13,350. The building work, which began in June, 1851, was contracted to William Doolin of Dublin. The first inmates were admitted to the new workhouse on 10th October, 1853, with the transfer of 231 men and boys from the old establishment. The old workhouse building later became use as an auxiliary lunatic asylum for male patients. The location and layout of both workhouses are shown on the 1885 OS map below. The new workhouse, one of the last that Wilkinson was to design, was somewhat in contrast to his earlier Tudor-style designs, and concentrated the bulk of the accommodation into a single large U-shaped block, up to four storeys high in parts. Clonmel new workhouse from the south-east, 2000. Clonmel new workhouse from the east, 2000. 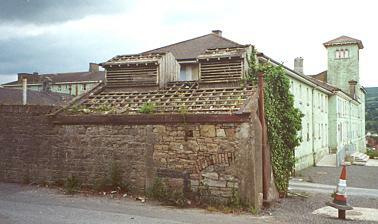 Clonmel from the north showing original brickwork, 2000. Clonmel new workhouse from the north-west, 2000.
Notable events in the later life of the new workhouse included the arrival, in 1883, of the Sisters of Mercy to nurse the sick in the workhouse infirmary; the installation of the public water supply in 1902, and of gas lighting in 1913; and the controversial decision in 1920 to refuse British ex-servicemen admission to the infirmary. In 1924, at the very end of its role as a workhouse, temporary accommodation was provided for local residents made homeless by severe flooding in the Old Bridge area. At the 1901 census, the population of the Union was 18,726 with 46 officials and 354 inmates in the workhouse and fever hospital. In 1924, following the formation of the Irish Free State, Clonmel's operation as a workhouse ceased, with the final meeting of the Board of Guardians taking place on 26th January. Existing inmates were transferred to County Homes in Cashel and Dungarvan. Although the former Clonmel workhouse was originally earmarked as the location of the new County Hospital, Cashel eventually took on this role. The Clonmel establishment became St Joseph's Hospital and in 1950 was upgraded to become the County Medical and Maternity Hospital. In 2000, contracts were signed for a major redevelopment of the site. 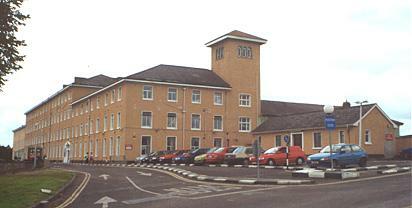 St Joseph's Hospital, Clonmel by Eamonn Lonergan (2000, published by author).